Let’s face facts: it is usually faster and easier for parents to get dinner on the table going solo than having their kids “help” them. Nonetheless, it’s so important for kids to learn practical life skills and how to be capable and independent cooks. I do my best to leave extra time for meal preparation so Kiddo and New Kid can contribute to meal times. It’s not easy to give over control and I’m not always successful but I’m trying. Here are ten suggestions which do not involve sharp knives or hot stoves. Remember: let go of perfection! 1. Read through the recipe. Do you ever find yourself constantly pausing in order to refer to the recipe? Get your young reader to help keep track of the instructions. 2. Cut up food. I know! I know! I just said no sharp knives. But there are lots of things that can be cut with a table knife. Think: soft fruits like bananas and strawberries. Also, be prepared to let go of your need for perfectly diced food. 3. Measure ingredients. Teach kids how to scoop, level and dump dry ingredients or measure and pour wet ingredients. 4. Pound spices. This is a favorite around here. Kids love to have a little fun with the mortar and pestle. 5. Assemble food. We make our own pizza once a week and the boys love to spread the sauce and put on the toppings. Other easy to assemble foods include burritos and tacos, sandwiches and wraps, and salads. 6. Wash fruit and vegetables. Teach kids how to scrub carrots and rinse off fruit. Kids love the salad spinner. 7. Mix ingredients. Once the ingredients have been measured, hand over the wooden spoon! 8. Pressing buttons. This one is perfect for toddlers. New Kid loves to press the buttons to grate blocks of cheese with the food processor, flip the lever on the stand mixer and press the blender buttons. Be sure to teach good safety habits, though. 9. Grease and line baking pans. If you have muffin tins, baking sheets, cake pans or other baking dishes you need slicked with some butter or lined with parchment paper, this is a great job for the kids. Kiddo especially likes to use the pastry brush to spread oil on baking dishes. 10. Set the table. Finally! Dinner time! 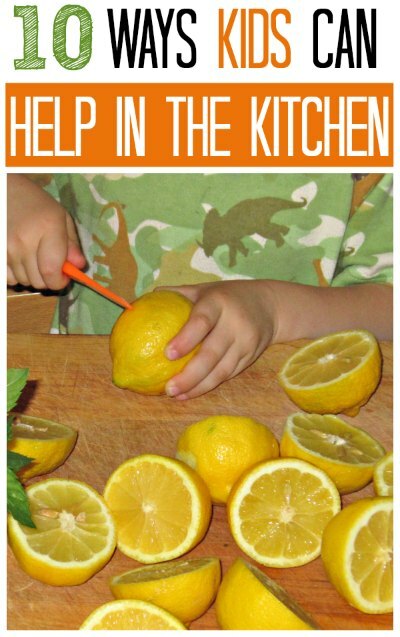 What are your favorite ways to get your kids working in the kitchen? Great ideas! My kids have been in the kitchen with me since they were super small – there are so many things they can help with…even if its just making things a bit more messy! Great memories are made and it builds a comfort in the kitchen that will help them as they get older. Great post! Great ideas! I love cooking with my little guys! I’d love to invite you to share on Saturday Show & Tell on Cheerios and Lattes! I know my readers will love your ideas as well! Hi! Stopping by from Triple T Mum. I love getting my kids in the kitchen helping me to make different things. I love this list! You've given me some extra ideas for when the twins are ready to get in on the kitchen action. I am featuring this post on Triple T Mum's Kids Co-op (14th June 2012). Thank you! We love cooking with our littles. Yes it does take extra time but I also find they are much better eaters of all their veggies when they helped grow, harvest, clean and cook them. We love the learning tower to help get out little ones counter height. We also have some wonderful accessories from small hands Montessori that really enable our littles to safely participate. I love watching my 3 year old wash,peel and then chop carrots! We’re also big fans of washing and cleaning all fruits and veg and of snapping asparagus and mashing guacamole. Cracking eggs is still a bit messy at 3 but oh so fun! Katie: Thanks for the suggestions. I love the idea of mashing guacamole, I bet they really get into that! Another reason I need to get a mortar and pestle. It has been on my list FOR-EVER and I am always hoping to find one at a yard sale or thrift store, but no such luck yet. You can purchase them fairly inexpensively I think. Our was a gift, but also you could make do with a wooden spoon and bowl. These are great suggestions! My girls love washing items and pushing buttons. Thank you for linking up to Discover & Explore. I’m featuring this post today. That is a great idea! What a great way to get them interested in the process.